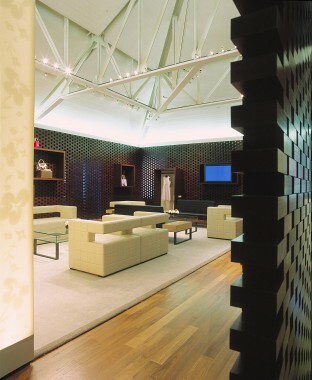 Situated under the sloping roofs and open truss ceilings of the historical Gump Building in Waikiki Hawaii the Louis Vuitton VIP room was designed by Eric Carlson as “a room within a room”. 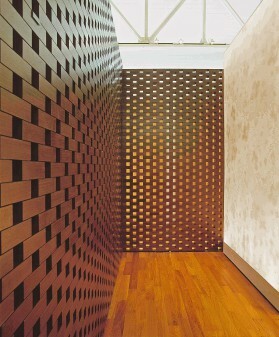 The walls are conceived as furniture by a dematerialized “Damier” ribbon composition of staggered wenge wood blocks and voids that encompass and define the VIP space. The translucent nature of the wall fragmented views inside and out and the multitude of square openings between the blocks also serve as a plug-in display frame system for the changing event activities. 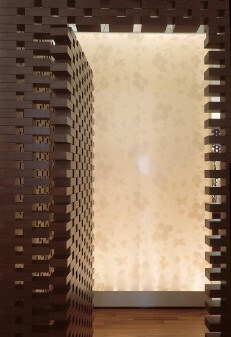 A series of design objects within the VIP room include seating and tables designs inspired by the LV travel trunks as well as a fitting room/lantern composed of two luminous layers of fabric printed with a re-composition of the LV Monogram flower pattern in the floral language of the iconic Hawaiian shirt.